and Caitlyn McIntyre told residents their vision for the ward. (Photo by Lauren Camplin). 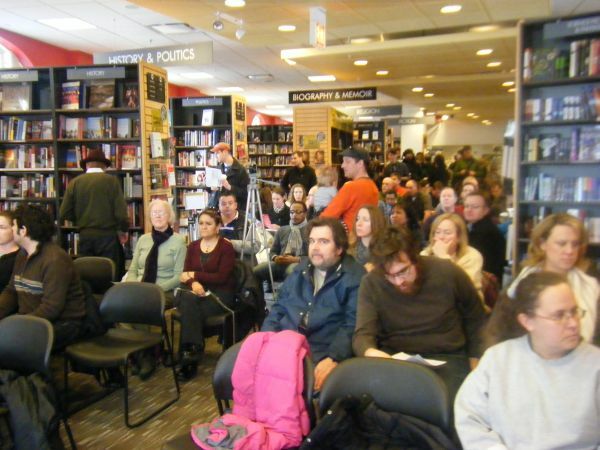 The 46th Ward Great Debate brought a large crowd to the second floor of Uptown’s Borders on Saturday. All 11 ward candidates attended the debate organized by the Clarendon Park Neighborhood Association, Uptown Neighborhood Coalition, and Uptown Coalition for Responsible Development. Residents from all over the ward with differing political stances united for the same reason. “When I found out there were 11 candidates, I thought ‘Where did they come from?’” said long-time Chicago resident Flora Bawanag. The event centered on five key issues Uptown residents are most concerned about: development, crime, TIF, the CTA and education. 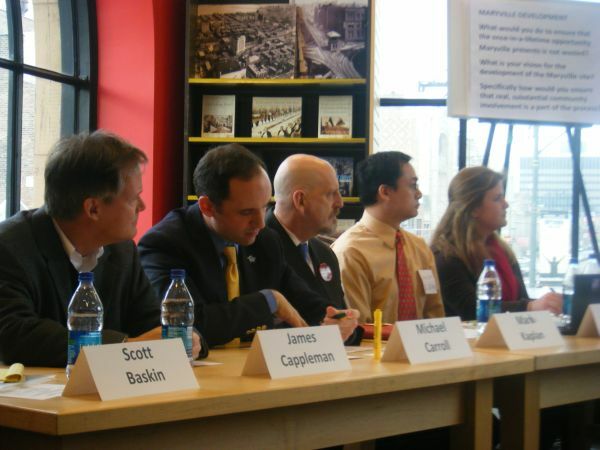 Each candidate had 90 seconds to answer prepared questions on the topics. Development talk focused on the latest renovation plans, the Maryville project, located at Montrose and Clarendon avenues. One of the debate host organizations, Uptown Coalition for Responsible Development, provides information and serves as the community voice on the issue. Currently, residents said they are frustrated with the plan itself and the lack of communication from developers. 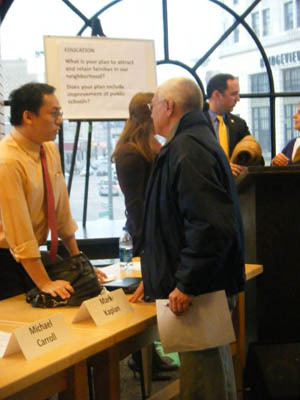 Candidates took similar stances on the need for community involvement in such large-scale plans. A longstanding issue of the 46th ward has been crime, a topic the opponents found much agreement on. The candidates unanimously stressed more policemen were necessary, especially on foot. Candidates Molly Phelan, Diane Shapiro and Caitlyn McIntyre correlated the reduction of crime to the lengthening of school days for children. “If you look at people that have been arrested recently for the gang activity in the neighborhood, they’ve all been young kids, they’ve all been teenagers,” McIntyre said. Along with improving crime and gang violence, candidates all spoke about “transparency and accountability” being the key factors in TIF issues and aldermanic decisions. It is no secret the Wilson Red Line stop needs attention and the issue was brought up in the debate Saturday. Voted one of the worst stops by the Chicago RedEye two years in a row, Wilson also is not handicapped accessible. Every candidate agreed that rehabilitation was necessary at the stop. “The Wilson El station is so critical to the vitality and economic health of the Uptown neighborhood and Broadway,” said Scott Baskin. Some were more eager than others to work with Target to create additional exit, mostly for its help in funding. One candidate even suggested moving the Wilson stop all together. “I have always been a big promoter of moving the el stop closer to Montrose,” said Don Nowotny, who attributed this stance to creating more equal lengths between el stops. Other candidates, such as Phelan, were hesitant on Nowotny’s idea, arguing that moving the stop would only continue to hurt nearby struggling businesses. With elections on Feb. 22, 46th ward residents are trying to sift through the information and see positive change the ward needs on key community issues.